The KB Suites & Spa is a sanctuary set within serene gardens which lead down to a beautiful beach. Most of the rooms overlook the sea and Vasilias Bay, which is ideal for explorers and couples who are just looking to relax and unwind. Enjoy an exclusive boat trip during the day and a private dinner service in the evening. Spend the day being pampered at the spa and leave feeling rejuvenated by the comfort and 5-star experience of your suite. In the day, you can enjoy relaxing in your own private gazebo on the beach, as you take in the amazing sea views or enjoy organised activities, including jet skiing. In the evening, experience an amazing à la carte restaurant, serving delicious, carefully created flavours. When you head back to your suite, totally unwind with luxury details including pillow menus and aromatherapy Jacuzzi bathtubs. The hotel has 28 suites. This is an adults only hotel. Only guests aged 16 and over will be accepted. Please note: there will be children at the Kassandra Bay Resort complex, which shares some facilities with the KB Suites & Spa. This buffet restaurant is open for dinner and serves a wide range of local and international cuisine. There are also special theme nights with cuisine from all around the world. 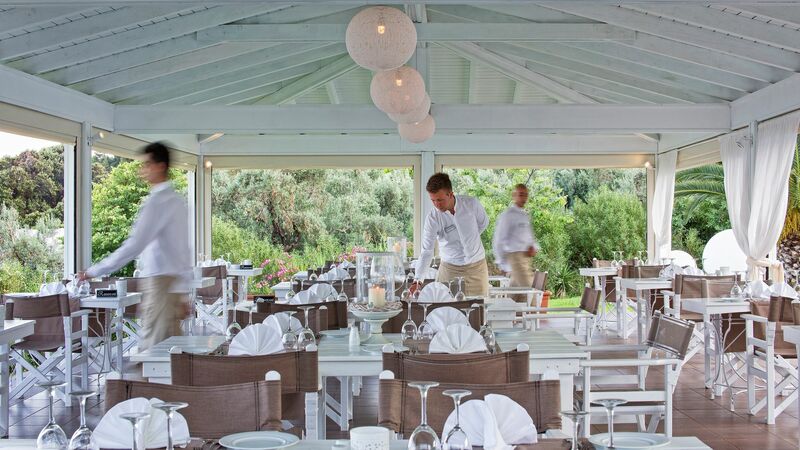 This restaurant is included for half board guests and is shared with guests from the Kassandra Bay Resort Hotel. This is a splendid à la carte restaurant with fantastic service and wonderful Greek and Mediterranean cuisine. There is also an excellent selection of wines. 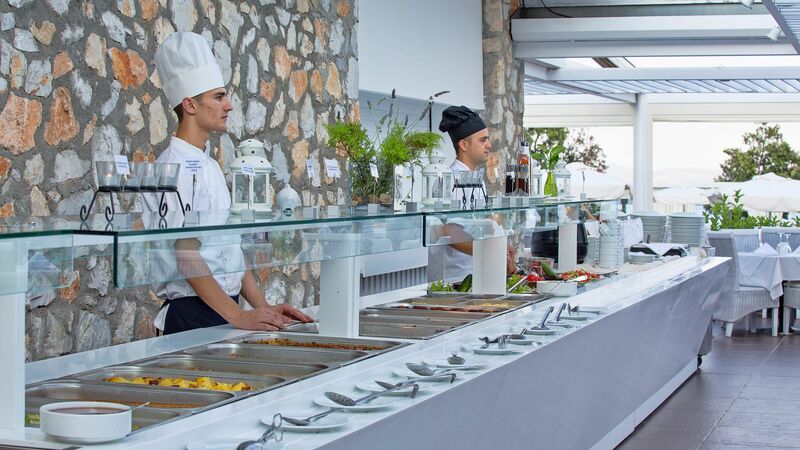 Overlook the sparkling Aegean Sea while choosing from a delicious buffet breakfast filled with vibrant colours and wonderful aromas. Take a dip in the pool or bask in the sunshine while sipping on refreshing smoothies and exotic cocktails. The bar also serves delicious snacks with the finest ingredients. KB Suites Spa has an elegant outdoor infinity swimming pool where you can relax while sipping on exotic drinks and delicious snacks. Spend the day in your own private gazebo, taking in the incredible views of the sea. 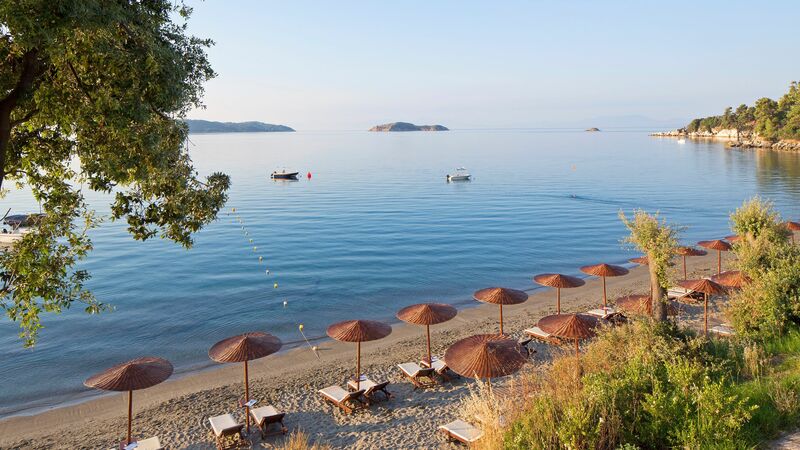 Relax on the private beach and be amazed by the beauty of Vasilias Bay. 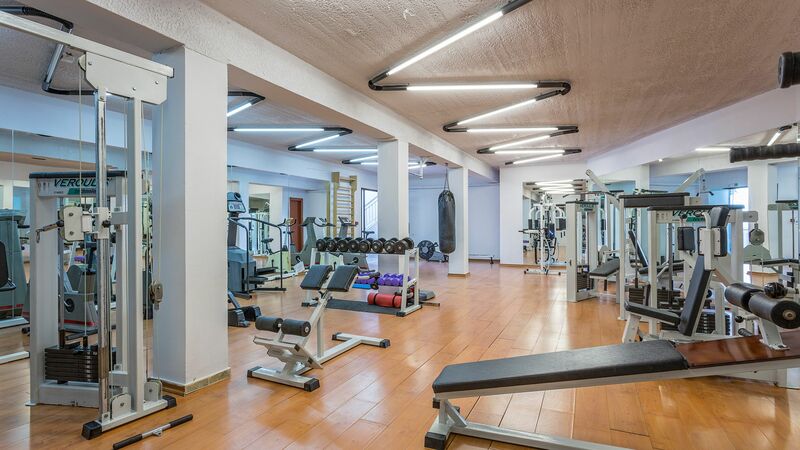 The hotel has a spacious gym with a variety of state of the art equipment. Keep fit an active during your holiday. 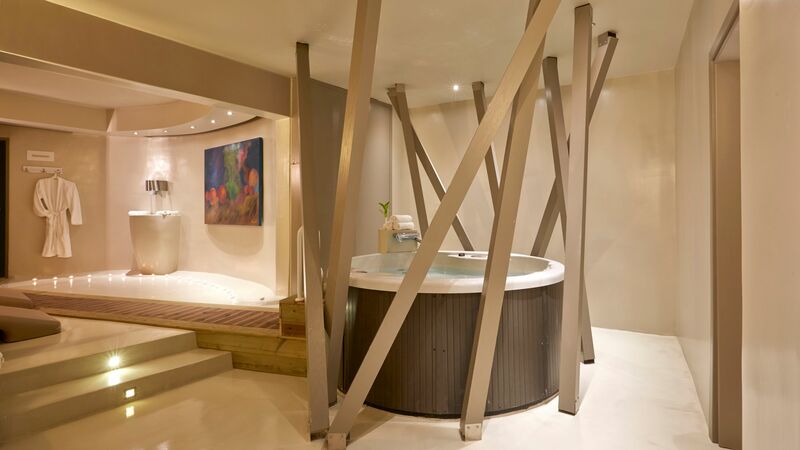 The spa is an oasis of calm where you can enjoy a range of treatments. Surrender to the sensual surroundings and blissful experience. Explore Skiathos with its unspoiled beaches and mesmerising beauty as you sail across its waters. Take a dive into the waters and come out rejuvenated. Master your cooking skills and have fun while enjoying delicious traditional recipes. Meals are created using fresh organic and local ingredients. KB Suites offers activities including cycling tours, fishing and trekking so that you can explore the island from a different perspective. Take a picnic and immerse yourself in its natural beauty. Take part in Pilates and Aqua aerobics, whether you are an expert or a beginner. Enjoy a game of table tennis together. Equipment is available at the hotel. KB Suites & Spa can be found in idyllic Vasilias Beach, on the south east coast of Skiathos. 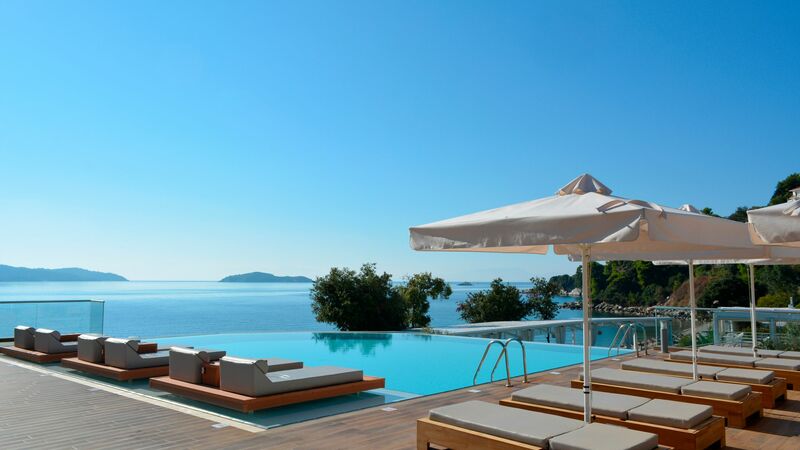 It’s in a peaceful area within easy reach of the cosmopolitan island capital, Skiathos Town. Here you’ll find whitewashed houses, pineclad hillsides and a golden sandy beach lapped by crystal clear waters. Spend long lazy days soaking up the sun, before settling down for a traditional Greek spread in one of the traditional tavernas. If you want to try something more active, windsurfing, sailing, and water skiing are available, while lively Skiathos Town is close by. Little ones will love the shallow waters for paddling, while boat trips are the perfect way to see the island. KB Suites & Spa is a 10 minute drive from Skiathos Airport. Deluxe Double Rooms Sea View are located on the second or third floor. They feature a double bed, bathroom with bathtub or shower and a balcony with panoramic sea views. Facilities include air conditioning, safe, minibar, telephone, digital TV, bathroom amenities and hairdryer. Junior Suites Sea View feature a double bed, open plan living area, bathroom with bathtub or shower and a private balcony with beautiful sea views. In addition to all of the above amenities, Junior Suites also include bathrobes and slippers. Junior Suites Outdoor Jacuzzi Sea View feature a double bed with open plan living area, bathroom with bathtub and a balcony with sea views and an outdoor whirlpool. Suites with Private Pool Sea View are located on the ground floor. They feature a double bedroom, separate living area, bathroom with bathtub and a terrace with private pool and garden and sea view. Deluxe Suites with Private Pool Sea View feature a double bedroom with en-suite bathroom, separate living room with double sofa bed, additional bathroom and an outdoor veranda with private pool and garden and sea views. Master Suites with Private Pool are located on the first floor and feature a double bedroom, separate living area with two sofa beds, dressing room, en-suite whirlpool, two bathrooms and a balcony with dining table, private pool and garden and sea views. Guests receive a free upgrade to Half Board (based on buffet service in the main restaurant) for holidays between 03 May - 30 September 2019, booked by 31 May 2019. We spent two weeks in July and I was very apprehensive due to reviews about the weddings that are held at Kassandra Bay. However I was reassured by the hotel management that it wouldn't affect us as guests. They were absolutely right. We had a lovely, relaxing and enjoyable holiday. We didn't have to get up at the crack of dawn to reserve sun beds either by the pool or by the beach. There were always beds available no matter what time of the day. All staff were lovely, polite and helpful. Our room was great and the beds were very comfortable. The maids came every morning and then gave a knock at night to see if anything was required. The water taxi is a great way to get into town. The buses are always busy and the taxi,s do not care how many they cram in their car. The restaurant on the beach serves great meals and also has a sister restaurant up in the hills which you should absolutely go to. The views are just stunning. They even collect you from the hotel and bring you home at no extra charge. I had a massage and facial whilst there too which was lovely. This hotel is not really suitable for older children or teenagers as there is nothing for them to do. The only negative I have is that there is no entertainment (2 nights only) Have already booked again for this summer. Can't wait. Wonderful welcome, beautiful hotel, we felt spoilt start to finish. The staff were lovely and helpful, plenty of food choices and also close to town if you want to grab a meal out instead. We would love to go back! “ Great stay, few tweaks needed though! We had a week here in September, and had a very enjoyable stay in the Suites, which were spotlessly clean. Unfortunately the hot water takes ages to come through, and little pressure, so using the in-room spa bath was a non starter. Loved the Suites infinity pool and large umbrellas, but the sunbeds are so heavy you need to be a weight lifter to move them. We would have gone to the beach but it was v hot, and the umbrellas on the beach provided only partial shade, so we stuck with the lovely pool area. We were slightly disappointed because our bedroom was at the back of the suite with no outside view, but the overall space in the suite is good and they are generally well appointed. Breakfast in the separate room was great. We only ate one dinner in the hotel, as we prefer to eat in town, and the water taxi is a perfect way to get there. Overall we will probably be back, but may choose a different room option. We booked this hotel through Tui (huge mistake). Firstly we asked for mattress toppers as the bed in Greece are usuall rather hard. These without would have been bricks. We also requested softer pillows. They were in our room but the beds sheets were not changed all week. Warning about pillows or toppers we had Bed Bugs. Bites were confirmed on my return home. For a 5 star hotel there is no mini bar. The bathroom door is a glass swing door which does not even lock and has a gap of around 2" no privacy whatsoever. Yes it is noisy. The drinks are silly prices. The staff (other than reception) are lovely and deserve a better hotel. Breakfast is ok but the area for breakfast is like a motorway serice station. The food, for buffet food is definitely 5 star. However, the restaurant opens at 7.30pm and the water taxi into town leaves at 8.15.pm Most restaurants open at 7pm. Is this to ensure you are drinking their overpriced spirits. The beach is ok. The courtesey room is not. It is a cave with no air con. There are four cubicles each with a toilet and a shower. We had to share with strangers (one a gentleman), we are two ladies travelling together. We all sid NOT ACCEPTABLE. Given 30 mins to get ready but asked if we were done after 10!. The hotel has had a cheap makeover and is not what I usuall get from 5 Star hotels. At the moment Tui have sent me nothing but waffle. Do not listen to the Rep, Lucy she does not know a thing about people travelling with Tui. Also be aware the air conditioning is ineffectual and is turned off when any door opens even for a minute (which is normal) however, you have to go and phisically turn it back on.